Methane is a simple chemical molecule and is a principal component of natural gas. The chemical formula for methane is CH4. It is colorless and odorless. Methane is created by bacteria that feeds on organic material. During the process, some methane can get trapped in the ground while some rises up to the atmosphere where it breaks down to (CO2) and water (H2O). When methane is burned in the presence of oxygen (O2, carbon dioxide (CO2) and water (H2O) is produced. The principal use of methane is as a fuel. Methane is classified as a greenhouse gas. It has a global warming potential (GWP) of 30. This means that for each kilogram (k) of methane emitted to the atmosphere has the equivalent forcing effect on the Earth's climate of 30 times that of carbon dioxide over a 100 year period. Methane has a short lifespan and usually breaks down within 10 years of its release to the atmosphere. According to an April 2012 NASA report, cracks in Arctic sea ice are leaking alarming levels of methane. Up to 4 percent of the methane on Earth comes from the ocean's oxygen-rich waters, but scientists have been unable to identify the source of this potent greenhouse gas. Now researchers report that they have found the culprit: a bit of "weird chemistry" practiced by the most abundant microbes on the planet. The researchers who made the discovery did not set out to explain ocean geochemistry. They were searching for new antibiotics. Their research, funded by the National Institutes of Health, explores an unusual class of potential antibiotic agents, called phosphonates, already in use in agriculture and medicine. Many microbes produce phosphonates to thwart their competitors. Phosphonates mimic molecules the microbes use, but tend to be more resistant to enzymatic breakdown. The secret of their success is the durability of their carbon-phosphorus bond. "We're looking at all kinds of antibiotics that have this carbon-phosphorus bond," said University of Illinois microbiology and Institute for Genomic Biology (IGB) professor William Metcalf, who led the study with chemistry and IGB professor Wilfred van der Donk. "So we found genes in a microbe that we thought would make an antibiotic. They didn't. They made something different altogether." The microbe was Nitrosopumilus maritimus, one of the most abundant organisms on the planet and a resident of the oxygen-rich regions of the open ocean. When scanning microbial genomes for promising leads, Benjamin Griffin, a postdoctoral researcher in Metcalf's lab, noticed that N. maritimus had a gene for an enzyme that resembled other enzymes involved in phosphonate biosynthesis. He saw that the microbe also contained genes to make a molecule, called HEP, which is an intermediate in phosphonate biosynthesis. To determine whether N. maritimus was actually producing a desirable phosphonate antibiotic, chemistry postdoctoral researcher Robert Cicchillo cloned the gene for the mysterious enzyme, expressed it in a bacterium (E. coli), and ramped up production of the enzyme. When the researchers added HEP to the enzyme, the chemical reaction that ensued produced a long sought-after compound, one that could explain the origin of methane in the aerobic ocean. Scientists had been searching for this compound, methylphosphonic acid, since 2008, when David Karl at the University of Hawaii, Edward DeLong at MIT and their colleagues published an elegant – yet unproven – hypothesis to explain how methane was arising in the aerobic ocean. The only microbes known to produce methane are anaerobes, unable to tolerate oxygen. 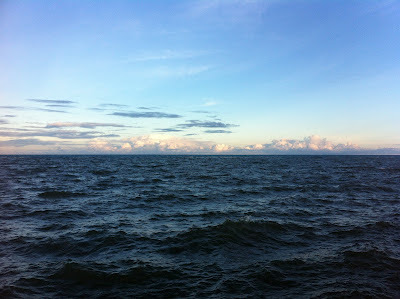 And yet the aerobic ocean is saturated with methane. To explain this "methane paradox," Karl and DeLong noted that many aerobic marine microbes host an enzyme that can cleave the carbon-phosphorus bond. If that bond were embedded in a molecule with a single carbon atom, methylphosphonic acid, one of the byproducts of this cleavage would be methane. Karl and DeLong even showed that incubation of seawater microbes with methylphosphonic acid led to methane production. "There was just one problem with this theory," van der Donk said. "Methylphosphonic acid has never been detected in marine ecosystems. And based on known chemical pathways, it was difficult to see how this compound could be made without invoking unusual biochemistry." Van der Donk's lab conducted further experiments that demonstrated that the N. maritimus was actually synthesizing phosphonic acids. 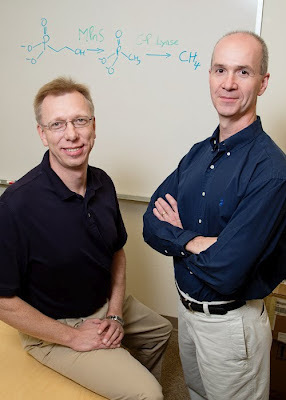 University of Illinois chemistry professor Wilfred van der Donk (left), microbiology professor William Metcalf and their colleagues discovered the origin of much of the methane in the oxygen-rich regions of the ocean. "The chemical analysis was a Herculean effort," Metcalf said. The microbe is "one-tenth the size of the standard lab rat microbe, E. coli, and grows at much lower cell densities," he said. The team relied on N. maritimus discoverer David Stahl, of the University of Washington, to grow the microbe in culture for their analysis. "So we grew 100 liters of culture to get a few, maybe 50 or 100 milligrams of cells, of which maybe 1 percent is phosphorus, of which maybe 5 percent is methylphosphonate," Metcalf said. The experiments indicated that the methylphosphonate was bound to another molecule, likely a sugar attached to the microbe's surface, van der Donk said. When N. maritimus dies, other marine microbes break the carbon-phosphorus bond of the methylphosphonate to gobble up the phosphorus, an element that is rare in the oceans but essential to life. This encounter generates methane. The biochemistry that allows N. maritimus to produce methylphosphonate is "unprecedented," Metcalf said. "Organisms that make phosphonates tend to use weird chemistry for all kinds of things," van der Donk said. "But this is very unusual. One of the carbon atoms of the HEP is oxidized by four electrons and the other is turned into a methyl group. I'm not aware of any other cases where that happens." The new findings will help those modeling the geochemistry of the ocean to understand climate change, Metcalf said. "We know that about 20 percent of the greenhouse effect comes from methane and 4 percent of that comes from this previously unexplained source," he said. "You have to know where the methane comes from and where it goes to understand what will happen when the system changes."